Does Mario Party's debut on the Nintendo DS make you want to put a lamp shade on your head for fun, or in shame? Find out the answer inside. After the debacle that was Mario Party Advance (and, yes, it was a debacle and still is), we were worried about how Mario Party would turn out on the Nintendo DS. But considering how much fun Mario Party 8 ended up being on the Nintendo Wii, our hopes were turned for the better. Now the party's officially made its presence with Mario Party DS for the two-screen game system, and while it doesn't quite do everything perfectly, it's a party to be reckoned with. In the game, Mario and his friends find themselves shrunken down by Bowser, who's up to no good as usual. He's set a trap, and they've strolled right into it, going microscopic. As a result, they need to complete a series of game boards to accumlate stars and grow back to normal size to put the big creep in his place. The story's not the thing here, though -- the actual party gameplay is. 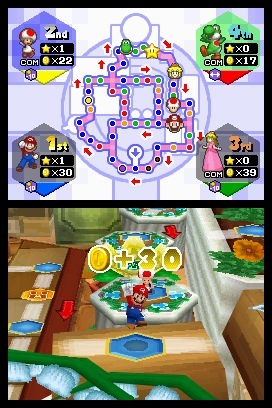 The boards in Mario Party are routine design, nothing staggeringly different from the ones featured in previous games. You move around spaces, occasionally stopping on coin ones, challenge ones and, in some cases, ambush ones. That's where Bowser or one of his colleagues manage to fenagle coins out right from under you, leaving you short on monetary funds to buy yourself a star (if you're not careful). However, the design of the mini-games are razor sharp. There's only a few duds here, otherwise you've got a series of games that use the touch-screen and microphone almost perfectly. If that's not enough, there's several stand-alone puzzle games that you can play by yourself or with friends, including variations of Puzzle de Pon and Columns. Awesome. Graphically and sound-wise, you shouldn't expect anything above the usual Party atmosphere. The visuals are colorful, and ripped straight out of Mario's universe. As for the sound, it's typical coin collecting and sound samples. However, those familiar with Mario's world should be more than comfortable with what's on tap. Where Mario Party DS really excels is in its multiplayer options. Thank goodness it has them because the single-player experience is tepid. If you crank the difficulty on the AI opponents too much, they'll own the board. If you make them too dunderheaded, they won't do much good during the mini-games or on the boards. 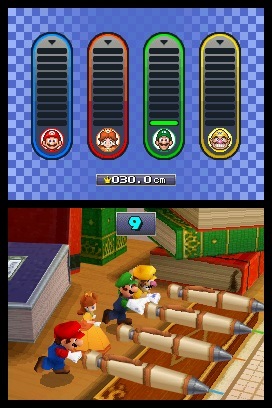 So it's best playing against others, and Mario Party DS has a splendid Game Sharing option. Up to four people can take part in a game with just one cartridge, an ideal quirk that makes it undeniable. The only question we're left asking is why the game doesn't have online play. Seriously, Nintendo's been on the ball with its Wi-Fi releases, so why didn't it consider it for Mario Party? The possibilities would've been endless. No matter. The truth be told, Mario Party DS is one of the better games in the series, with replay value galore -- especially if you got friends around. If you're a solo player, you might want to show concern before you pick this up, especially without the online options. Maybe rent it first. Otherwise, "Party on, Mario! Party on, Luigi!" What's Hot: Fun against friends locally, as you can share the game with one cartridge; fun mini-games and stand alone puzzle games; controls are familiar for Mario Party fans. What's Not: Can't take it online for some odd reason; computer AI is either a pushover or a cheater.